Yesterday was the install day – it was cold out but the biggest challenge we had was knowing there was Guinness and Smoked Barbeque only feet from where we were standing and we couldn’t touch it! We started the install by taking some final measurements then prepping the sign to be raised in the air. Now this baby is around 200lbs so it’s going to be tricky. 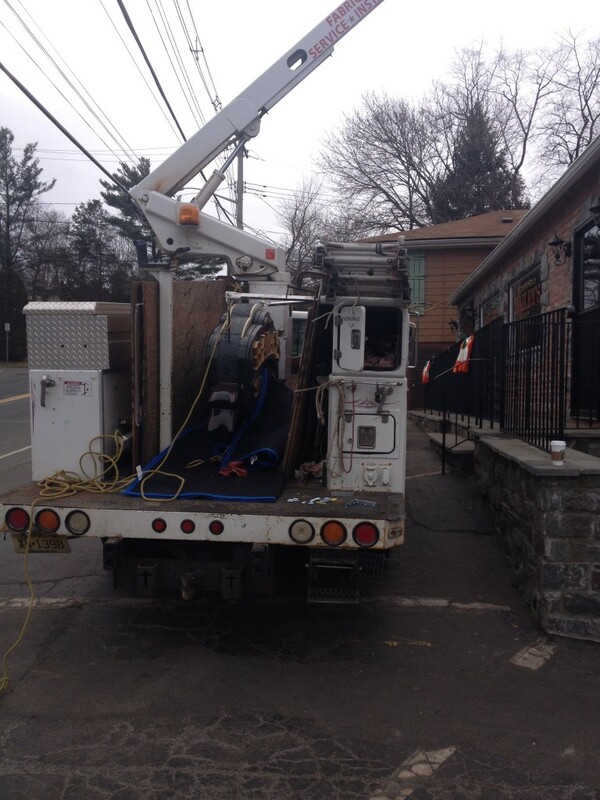 We have the rope secured and tied around the bucket truck. I’ll be on the ground with a guide rope – John is working the bucket. Up we go. Now I’m scared standing on a chair let alone getting up on a roof, Brian climbed up like a monkey and to get the sign safely connected. Not totally sure what he was trying to say in this picture. It was right after I told him that Bailey’s ran out of Guinness.